I love playing around with bright eyeshadows. 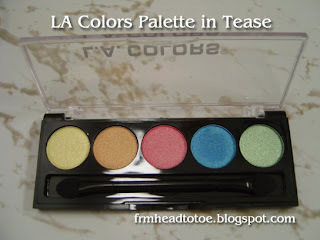 Before I knew about shadow primers and which brands were more pigmented, I used to get so frustrated with colors not showing up on my yellow-undertones. Now that I realize which bright colors look awesome AND show up well, I love to play around with combinations. I've seen a few rainbow eyes on makeup blogs and youtube but I wanted to try to make a look that used brights but were still wearable for the daytime and this is what I came up with. The look came out much more vibrantly in person, but didn't scream '80's. *LA Colors palette in "Tease"
*NYX Pencil Eyeliner in "Moss"
First, I applied the eyeshadow primer then used the orange color on the inner half of the eyelid. Next, I used the hot pink color in the crease and outer corner. I used the green eyeliner to line my bottom lash line and put electric blue eyeshadow on the outer half of the lash line. To finish, I highlighted my browbone and tear ducts and applied black liquid liner to my upper lash line. Top it off with some black mascara and you are set! It was a really fun, summery look for me so let me know if you guys try it out! can you do a step by step tutorial for the eyelid tape? also can you do a post on your hair? color? maintenance? Thanks! I use max factor lp waterproof, too, but it tends to clump on the top. Is there a good uhn. Eyelash brush-thing to use to get rid of the messy parts? Love your blog. I was wondering what kind of camera do you use to take your makeup pictures? and what kind of setting? I have a canon sd 870IS but at times i have to use the flash and it's too bright for the makeup to show. I would appreciate it. Hey Jen! I love how you did your eyes!! I'm afraid of buying those ulti-colored palettes though, since I never know when I'll wear flashy colors like those! I have a video/tutorial request: How to remove your makeup the proper way Thanks!! Anonymous2: I really love Sonia Kashuk's double-ended folding eyelash and brow brush. I have a photo of it at the bottom of the Makeup Brushes post. One tip to keep from clumping is to make sure NOT to wait for the first layer to dry when you are applying thicker layers. Hope it helps! Anonymous3: I use Clinique's Take the Day Off makeup remover on a cotton ball for removing all of my waterproof makeup and tapes. They slide right off! I've found that dabbing warm water over it for a few seconds works also, but not as well. Thanks, I missed your tutorials hehe! Glad you had a great time on your honeymoon. Surprisingly I found LA colors for sale in this shop in Australia too! Unnie! You are so pretty! I have a double lid...but only on one eye! It's frustrating... Do you suggest I use eye charm on both eyes?